Did you know that the city is looking to turn the Cheasty Greenbelt into a mountain bike park? There’s a meeting about this on Tuesday. The project, in my opinion, is being pushed through with as little noise as possible to avoid opposition. 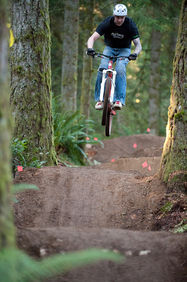 Seattle Parks and Recreation invites the community to join in the Cheasty Mountain Bike Pilot Project public meeting on Tuesday, March 25, 2014 from 6:30 to 8 p.m. at Jefferson Community Center, 3801 Beacon Ave S, 98108. The pilot project will take place in Cheasty Greenspace, located on the east slope of Beacon Hill directly above the Rainier Valley and Martin Luther King Way. The project will provide a soft surface mountain bike trail at Cheasty Greenspace. The goal is to provide a mountain bike experience for users of all ages and abilities in conjunction with ongoing and future forest restoration. Cheasty Greenspace, aka Beacon Bike Park. The Seattle Parks staff will be managing much of the process for building the park. However, they are looking to volunteers (all of us) torestore the 34 acres of forest and build the trails. Please stay connected to these efforts by joining our email list below and by liking our Facebook page. Dan, it would be helpful to know what your concerns are. I am a supporter of the Beacon Bike Park not because I’m a mountain biker (I’m not) but because I look forward to the park being free of invasive species and I’ll enjoy the walking trail that’s part the project. If you haven’t walked through Cheasty Greenspace/Mt. View (south of Columbian Way) in the past couple years – it’s an amazing restoration effort. Neighbors are walking through the park on new paths that used to be choked with ivy, blackberry, holly and laurel. To follow up on this, as soon as this original post went up, CC Source was contacted by a number of folks working directly on the project making sure both sides are fairly shown. They are in the process of forwarding some more info to post to the site. Scott, pretty sure that my comment was neither pro/con on the bike park. My issue is simply that it has not been widely publicized. None of my neighbors have heard about the project, and we are in very close proximity of the park. None of the blogs have heard about out or reported on it. The newspapers haven’t even commented on it. Oh, but the bike blogs all have the info. Odd. Why has the greater community not been contacted? By city ordinance, you must contact those within 300 feet of the park boundaries. Was this done? And if so, why stop at 300 feet? I would contact every address within a mile at minimum, after all, you want as many volunteers and donors as possible, right? If this is being built for the local community then they should know about it. But again, it only seems those within the bike community know that any of this is going on. As far as neighbors not being aware of the Bike Park project that the Parks Board approved earlier this year – I can report that at the Parks Board meeting I attended earlier this year where it was approved they had received a lot of public comment both for and against the proposal over the previous several months. Several neighbors of the park testified at that meeting and had clearly testified at a previous board meeting where the topic was on the agenda for public discussion. The board approved the project after weighing a lot of input and issues. I know from observing lots of public processes over the years that it’s hard to get residents involved in even projects happening in their backyards. Only a few people will show up to public meetings of Design Review Boards or similar meetings. I look forward to the Bike Park plans being improved and adjusted in the coming weeks and months while extensive restoration efforts get underway.